William Edward Wagner (born July 25, 1971), nicknamed "Billy the Kid", is a former Major League Baseball relief pitcher. 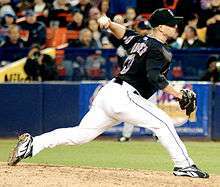 He pitched for the Houston Astros (1995–2003), the Philadelphia Phillies (2004–2005), the New York Mets (2006–2009), the Boston Red Sox (2009), and the Atlanta Braves (2010). Wagner is one of only six Major League relief pitchers to accumulate a total of 400 or more saves in his baseball career. Wagner was selected in the first round of the Major League Baseball draft in June 1993 by the Houston Astros. He pitched exclusively as a starting pitcher in Minor League Baseball until his major league debut. In 1994, Wagner led all North American minor league pitchers in strikeouts, with 204. 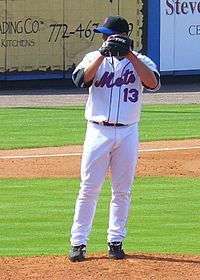 Wagner made his first Major League appearance with the Astros, as a late-season promotion from AAA baseball, on September 13, 1995, pitching against one batter late in a 10–5 defeat by the New York Mets. This was his only opportunity to pitch for the Astros that season. ↑ Deford, Frank (August 11, 2010). "In Sports, Left-Handers Exploit Edge Every Day". NPR. Retrieved 2011-02-18. ↑ Krider, Dave (May 2, 2013). "Billy Wagner returns home to coach son's high school team, run charity". MaxPreps. Retrieved March 27, 2014. ↑ Metzinger, Fritz (June 27, 2013). "Former MLB closer Wagner savors new challenge as Miller baseball coach". The Daily Progress. Retrieved March 27, 2014. ↑ "1994 register pitching leaders, sorted by strikeouts". Baseball-Reference.com. Retrieved October 16, 2016. ↑ Lilly, Brandon (June 12, 2003). "Astros seem a bit baffled by their odd no-hitter". The New York Times. Retrieved February 17, 2016. ↑ "Fireballer traded for Duckworth, two others". ESPN.com. Associated Press. November 3, 2003. Retrieved June 21, 2012. ↑ Noble, Marty (November 28, 2005). "Wagner introduced at Shea". MLB.com. Retrieved 2009-10-03. ↑ "Wagner has no regrets over comments". May 9, 2006. Retrieved September 23, 2010. ↑ "Mets' Wagner to Have Elbow Surgery, Is Out for 2009". Bloomberg. September 8, 2008. Retrieved 2008-09-08. ↑ Blum, Ronald (September 9, 2008). "Mets' Billy Wagner will be out through 2009 season". The Associated Press. Archived from the original on September 13, 2008. Retrieved 2008-09-10. ↑ Noble, Marty (September 9, 2008). "Wagner vows to pitch again in Majors". MLB.com. Retrieved 2008-09-10. ↑ Puma, MIke (September 12, 2008). "Wagner: I've played my last game with the Mets". Fox Sports via the New York Post. Archived from the original on September 14, 2008. Retrieved 2008-09-15. ↑ Buster Olney. "Source: Mets have 4 days to make deal". ESPN The Magazine. Retrieved September 23, 2010. ↑ "Mets to get two players for Wagner". ESPN. August 26, 2009. Retrieved September 23, 2010. ↑ Benjamin, Amalie (December 3, 2009). "Wagner gets 7m from braves". The Boston Globe. Archived from the original on January 13, 2010. ↑ Mark Bowman (December 2, 2009). "Braves get a new closer in Wagner". mlb.com. Retrieved September 23, 2010. ↑ Mark Bowman (April 30, 2010). "Wagner says he'll retire after '10". Retrieved September 23, 2010. ↑ Mark Bowman (June 26, 2010). "Wagner closes out No. 400 with heat". mlb.com. Retrieved September 23, 2010. ↑ David O'Brien (July 11, 2010). "Wagner declines All-Star invite, opts to rest ankle". AJC.com. Archived from the original on July 14, 2010. Retrieved September 23, 2010. ↑ "October 3, 2010 Philadelphia Phillies at Atlanta Braves Play by Play and Box Score - Baseball-Reference.com". Baseball-Reference.com. Retrieved July 27, 2015. ↑ "Atlanta Braves' Billy Wagner hurts left side, leaves Game 2 vs. San Francisco Giants". ESPN.com. Retrieved July 27, 2015. ↑ "NewsAdvance.com". NewsAdvance.com. Retrieved July 27, 2015.